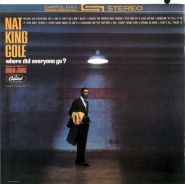 A Pile o' Cole's Nat King Cole website - Where Did Everyone Go? Where Did Everyone Go? is a great classic pop "concept" album, featuring affecting vocals by Nat King Cole at the height of his art in this direction, fine songs and top form arrangements by Gordon Jenkins in solid vintage Capitol production and stereo sound. Certainly a classic of its genre. Not exactly a lifestyle accessory to reinforce positive thoughts while munching a Klondike bar, but on a lonely night with the right wine... it's priceless. Nat King Cole and Gordon Jenkins collaborated on three album projects: Love Is The Thing, The Very Thought Of You and this album. Their titles reflect the approach to the subject: we might say that Love Is The Thing is about love in a romantic and romanticized sense; The Very Thought Of You as expressions of one in love, having a heady, euphoric sense of bliss; and Where Did Everyone Go? is ...after. The bliss is chopped down to pathos, the songs and the approaches to them are expressed from one who had and now has not. The sequencing of songs isn't entirely random, at least not the first and last three selections, the "bookends" if you will, which make a rather disquieting suggestion. The album opens with our learning of someone's unasked-for reminiscing about how things used to be. Whether we may see any blame as to why he is where he is now isn't the point here, the point being that he is and we can come to understand that he can't just forget and move on to another round. Various stages of realisation, rationalisation, reminiscing, longing and struggle come and go before the album ends in a defeated resignation. This is a haunted and haunting world. Well he knows the beauty in things, a keen expression being the sensory-infused reading of the line from If Love Ain't There, "in the warm spring air." But what was once love, to which so much was related, can now be an ache or worse as it lingers, as much as he tries to rationally tell himself, "if it ain't there, it ain't there." Even as spring blooms all around him in the standard Spring Is Here, he can only wonder at how isolated he is left. "Spring is here ...I hear." That phrase in the Lorenz Hart and Richard Rodgers-penned standard has never been as acutely expressed as it is here. That is the angle at which the readings in this album excel and which distinguishes it as a creative pinnacle above and beyond being a finely crafted album of beautiful music. The music and lyrics could be approached different ways of course, with a somber, perhaps resigned and gently confiding manner being most reasonable to expect given Nat's nature and the warm nature of the past collaborations with Gordon. But they did not take that approach here. Everything from their approach suggests to me that they opted to highlight the dramatic angle with a kind of high-keyed, assertive grandeur so to speak - like a bare spotlight cast in the dark - much as Nat and Gordon had used their dynamics to feel out romantic sentiment and blissful warmth, respectively, in their previous two projects. The vocals and arrangements follow suit, tending to be grander, more assertive, more tension less release, so on. The result can be quite effective and is a pointed contrast in many respects to Love Is The Thing, just like the rest of its themes. As said it may not be quite what one expects, especially from Nat. Once taken on its own terms its creative approach may be better appreciated. I seem to remember it took a while before the album struck me right. Nat tended to record lesser-known songs more often than the familiar, and this album, despite a theme which might have begged many other folks to stuff it with standards, is no exception. The standout to me is I Keep Going Back To Joe's. Coming from the tragic backdrop to the fore at times, Nat's way of being personable, open and gentle shines as he relates the scene, somehow being both wistful and affected in a popular song equivalent of a moody, poignant photograph or portrait of a lost man at a bar. On the more often recorded side of the selections, The End of a Love Affair has perhaps the stiffest competition, with several great versions over the years. Still it's my favorite here and I don't feel it's been bettered. In particular, the contrast in his voicing of the line, "And the tunes I request / Are not always the best / But the ones where the trumpets blare" gets me, ranging from the candidly needy softness of "request" to a bald and surprisingly literal "blare!" Likewise Gordon Jenkins' sense of musical drama and contrasts lends itself to this song like hand in glove. A dramatic self-portrait song, (Ah, The Apple Trees) When The World Was Young has many versions, most of which, to be blunt, sound rather sappy to me. Despite this having a scoring that might have prompted the most histrionic of performances, I find this to be easily the most moving version I've heard. Nat is quite assertive and digs in vocally, to a stronger overall effect dramatically and musically, while perfectly tied to Gordon's setting of a viscerally visual Technicolor night. It was a surprise to me, going into it not caring for the song and ending up struck by it. Two more songs were recorded at the same sessions for this project and were ultimately left off the album: Happy New Year and A Farewell To Arms. They were the first two of the sessions and it's my suspicion that they sensed things weren't clicking as they'd like. Personally I agree they're not up to the same level as the rest and feature a less than inspiring chorus. Nat's vocal in Happy New Year is rather good, but it seems to me that Gordon's arrangement just wasn't striking the right vibe. Gordon seems to have made some adjustments, including dismissing the chorus, quickly striking gold thereafter. Nat is such a great choice for that song that the relative failure of this attempt is all the more disappointing. The definitive Happy New Year to my ears remains the one Judy Garland made with Gordon in 1957, and A Farewell To Arms just doesn't do much for me. Still, that's a relative measure. Even the two "rejects" have their moments, as one might expect. Happy New Year and A Farewell To Arms were only issued years later with overdubs. Naturally they're better as originally recorded, but so far are only available in original form on the 1960-1964 Bear Family box set. Some feel Nat's greatest vocals are on this album; I'd agree it has Nat's greatest vocals of dramatic ballads. While his voice by this time is raspier, drier, with a less pliant and supple fluidity as he had in earlier years, the maturity of his technique and the use of his "late era" voice bring a palpable sensitivity and depth of nuance and color to words and feeling which is of far greater importance to these songs. In addition, the longer, arching lines of his later style is wholly appropriate for the aesthetic style of this project, only enhancing its grand, dark beauty. Yet it's not all that well known. The timing, title and theme of Where Did Everyone Go? were eerily apt. 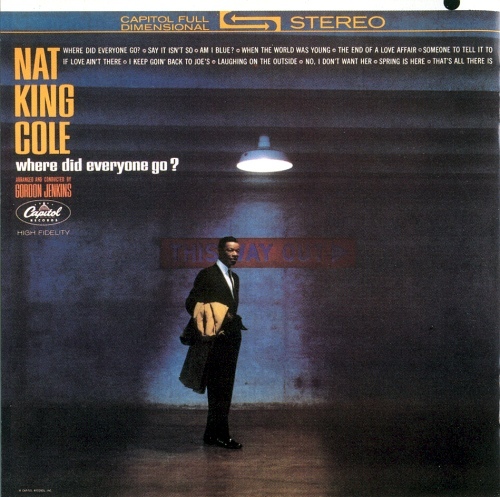 Nat Cole's 26th original album by my reckoning, it turned out to be a high point on the ending side of a lot of things, including the prime era of the specific musical genres it is fashioned from, the coinciding vintage era of the organization producing the record and tragically, of Nat himself. Capitol Records had been at the forefront of what we might now call "classic pop" when that particular art/genre was enjoying the last gasp of its "golden age" as the mainstream music of America and many other countries. As Rock'n'Roll, among other things, was coming into its own and public tastes were rapidly shifting, some artists were still achieving much widespread success with music based in the Swing and pre-Swing eras. Capitol had an impressive range of the finest talents on their label, including such iconic greats as Frank Sinatra, Nat King Cole, June Christy, Louis Prima, Keely Smith, Dean Martin, Judy Garland and musical arrangers, musicians and technicians whom easily ranked among the finest. Their whole organization, offices and studios both based in their landmark Capitol Tower, was an emblematic part of the cultural scene of the era. But times were indeed a-changin'. By the time of this album Capitol had lost many of its luminaries in the classic pop field (including Frank, Dean, Prima, Keely) and ties had loosened with others for varied reasons (including Judy, Nelson Riddle and Billy May). Capitol's Country and Western, or perhaps more accurately, Country-and-Folk-Pop interests were still going very well with artists from The Kingston Trio to Merle Haggard and Buck Owens and would continue to thrive for years to come. The already decimated classic pop side was largely supplanted by Capitol's overwhelming successes in rock, principally with The Beach Boys and The Beatles, both of whom happened to have started their careers with Capitol/EMI the very same year as Nat was making this album. An album of similar caliber made 5 years earlier was a huge mainstream chart topper, sitting at Number One for quite a spell. In 1962 - 63 this project had little hope of being a big hit. Compounding the situation, this was an album with a depressing, darker mood, which was bad news for sales back then. Undoubtedly fans of the genre, including enthusiasts of Frank Sinatra and other peers, recognized this as a classic album, but it wasn't likely to get far with the most popular outlets of radio or retail. Yet Nat and Company - still at Capitol after most others had gone - chose to make this album in this style in the face of waning commercial prospects. Even in technical respects this album maintained the same creative approach, personnel, studios and equipment as Nat's previous recordings: recorded live to dedicated mono and 3-track stereo in only two focused sessions with everyone performing together in the studio. That extended to the vinyl mastering, which at least on the contemporary pressings I've heard, sounds closer to vintage Capitol of the past compared to the "overcooked" character heard on much of Capitol's vinyl from the '60s (beginning in 1962 and affected Nat's other vinyl releases in '62 on). This album is the prime illustration of the method I suspect Nat and Company chose in response to the changing climate. Just as they had tried a variety of approaches to cover Nat as a pianist and vocalist into the mid-50s, they appear to have divided efforts between projects that endeavored to keep them in the popular game, such as produced the mega-hit Ramblin' Rose, and the occasional project based on the musical sensibilities they were more familiar with and might have held in higher regard creatively, such as this album or the dismal selling, beautiful album of ballads from 1960, The Touch of Your Lips. Sometimes there was a happy middle ground, as with the hits-centered anthology The Nat King Cole Story, but it seems to me that in their efforts to hit both quality and quantity, they sometimes ventured to projects they might have looked upon as leaning pretty heavily one way or the other. An inclusive approach that also involved prolific recording and releases, but it served Nat, Capitol and ourselves well through the years. This effort was not rewarded any too well. Sales were apparently anemic and it has spent years out of print. Most people bought the sing-along-with-Mitch-esque pop of Ramblin' Rose and Those Lazy-Hazy-Crazy Days of Summer instead. Today we may appreciate the approach Nat and Company took to their changing times all the more acutely. Whereas Ramblin' Rose and its relations have dated to being an acquired taste not as broadly embraced today, Where Did Everyone Go? is just as haunting now as it was then. We are fortunate they chose to make both albums instead of opting exclusively for the best bet for sales at the moment. As far as it concerns Nat, some folks also consider this album to be Nat's last "masterpiece" level album and to feature his finest late-era vocals. Given the nature of this project, its commercial reception and the steep odds of having much success at a classic pop album in such styles at the time, it's impossible to say if this album would have been followed by another collaboration of Nat and Gordon and a bit difficult to figure where they would have gone from here if they had. I'd suggest that Frank Sinatra carried the course ahead as far as that went in his subsequent collaborations with Gordon, particularly with September Of My Years, with much success. At any rate, Nat would not have enough time ahead of him for us to have seen what they might have done. This album stands as a fitting if stark consummation to this side of Nat King Cole.